"...The Holy Grail dudes are about to drop Times of Pride and Peril, their most compelling release yet via longtime label Prosthetic Records, and are also gearing up to bring their electrifying heavy metal antics to fans across the entire continent (on a North American tour that actually includes more than two Canadian dates!). On record, they sizzle, but the live setting is where Holy Grail really shines. The band's calling card—beyond its firm grip on traditional heavy metal glory—is its fiery, incredibly talented performances onstage, especially from dual guitar shredders Eli Santana (also of Huntress) and Alex Lee, and soaring vocalist James Paul Luna. We dare you to go to a Holy Grail show and leave without a sore neck and a big fat grin splashed across your face. Times of Pride and Peril is out February 12 via Prosthetic Records (preorders are up now), and we're stoked to be premiering the video for "No More Heroes" right here. 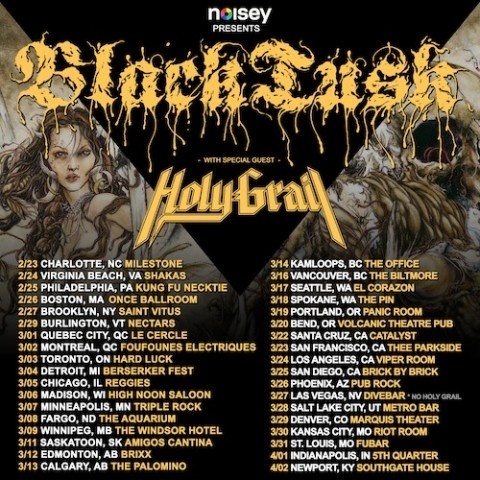 Scroll down for an extensive batch of North American tour dates alongside guitar virtuoso Marty Friedman and Noisey faves Black Tusk."